Greetings! I hope this monthly newsletter finds you and your family doing well. We had a really special graduation ceremony for the Class of 2018 on Friday (6/1). I want to thank all who came out to show their support and all that made the ceremony a success! We wish the Class of 2018 nothing but the best as they move to the next chapter in their lives'. Underclassmen Awards are this Friday at 8:30 am in the SA gymnaisum. If your child is receiving an award you will be notified tomorrow via email. I am asking for your support in enforcing our dress code. The warmer weather promotes comfortable dress; however, some students are disregarding the dress code. These students will be asked to call home for a change of clothes. Further infractions will call for disciplinary measures to be applied. Again, my intention is not to cause unnecessary headaches for parents/guardians, but we have a policy that clearly states what is acceptable. Your assistance in helping with this is beyond appreciated. The policy can be found in our handbook. I want to commend all our students for their efforts with MCAS over these last few months. The computer-based testing (CBT) went smoothly and was less disruptive to the school day when compared to the paper-based MCAS. We are still waiting for The Massachusetts Department of Elementary and Secondary Education (MDESE) to fully transition to computer-based platforms for all exams. We are confident this will happen in the coming school year. A reminder: (MDESE) has recently made changes to their requirements for the John and Abigail Adams Scholarship Awards. Beginning with the class of 2016, a student’s score on a high school Science and Technology/Engineering (STE) MCAS test will be added to the eligibility criteria for the John and Abigail Adams Scholarship. If you would like to inquire more about the new eligibility requirements please visit the scholarship site. The state also provides other opportunities to students via awards and/or scholarships. These opportunities are available here. 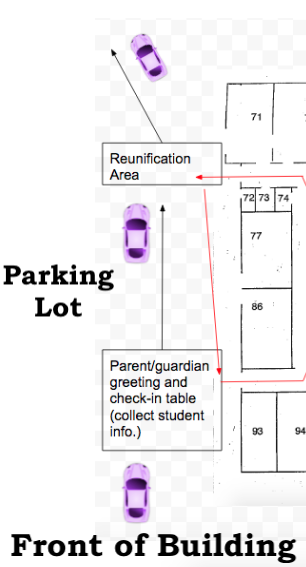 On Wednesday, June 13 we will conduct a reunification drill at Smith Academy. The purpose of this drill is to assess our preparedness in the event we ever have to relocate our students off of the school campus. If this was not a drill, you would receive a communication via our emergency notification system explaining the purpose of the relocation and location of site pick-up (site pick-up is kept confidential unless we are actually relocating). This drill will only be conducted with students who are picked-up by a parent/guardian. The drill will be initiated at approximately 1:40 pm. The drill will not effect pick-up times, we will officially dismiss at our normal 2 pm time. We ask that all parents/guardians that pick-up their child/ren line their cars up in a single-file line alongside the building. The loop will be for buses on this day (see image on the right). Faculty will be outside to coordinate and direct all movement involved with this drill. We appreciate your cooperation. Underclassmen (Grades 9,10,11) will be administered their final exams on Friday (6/15), Monday (6/18), and Tuesday (6/19). Once students have completed their exams, they will be dismissed from school. Most students will complete their exams by 11:15. A bus will be provided for busing students at 2 pm. All middle school students will sit for their final exams on Monday and Tuesday (6/18 & 19) which will conclude at 11:15 am with make-up exams offered in the afternoon. Middle school students are dismissed at 11:15 at the conclusion of their exams on these days. The only exception to middle school final exams being offered on Monday and Tuesday is the grade 8 foreign language exam. This final exam will be administered on Friday afternoon (6/15). *Wednesday June, 20 is a final exam make-up day and also a half-day. Students who missed final exams June 15-20 should plan on making up their exams on this date. As the last day of school draws near, educators will start the text book collection process. Any textbooks and/or school materials that were distributed to your child/ren will be collected. Any lost or damaged items will need to be replaced. We will provide the price and/or ordering information if you would like to order yourself.